I have written before about the whole gynecomastia thing and its attendant effects on me as a dancer. So, until now I have never found a gynecomastia vest that made me 100% comfortable in a tight, fitted shirt. Well, that may just have changed. I found a bunch of reviews for an option produced by a relatively new company, GC2B, and was so impressed that I bit the bullet and bought one. They’re made and marketed with transguys in mind, which might be a bonus for a scrawny, fine-boned dude like me whose Moobs are mostly just loose skin leftover from the crazy side-effects of Risperdal and whatever cocktail of anticonvulsants and lithium I was taking at the time. Regardless, all I can say is OMG OMG OMG! 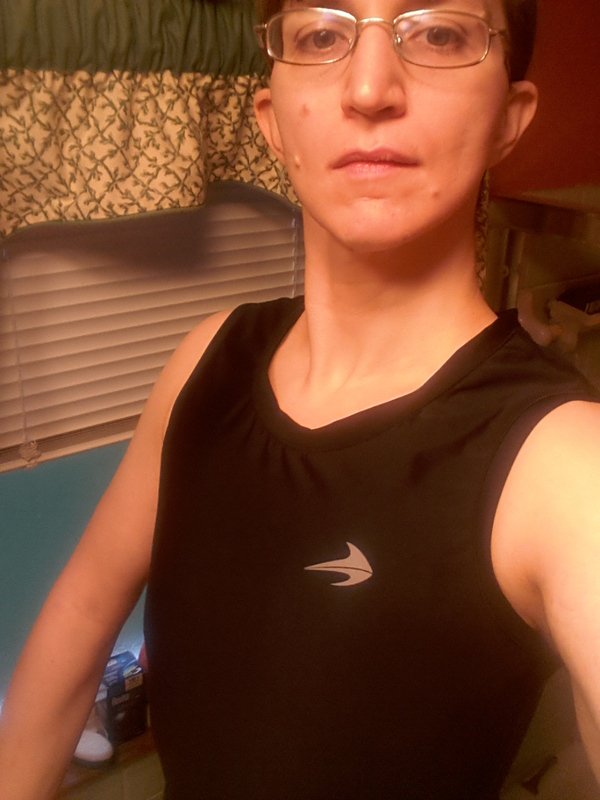 Look, here I am wearing just the new vest under the wicking shirt I wear to ballet class, and the upper half* of me is all Halberg-esque and stuff! Also, this thing is hella comfortable this far (but I haven’t worn out to class yet). Also, as you can see, I look very studious in my glasses, which is probably good because I’m busy writing admissions essays. Anyhow, further reports to follow after this thing makes its class debut. I had written a long and pithy caption for this, but apparently using WP’s new visual editor to make a quick change to it was a terrible idea and resulted in the whole caption being lost. *The lower half is still all Nijinsky-like, though. Posted on 2015/11/16, in balllet, dances with moobs, life and tagged ballet, dances with moobs, GC2B. Bookmark the permalink. 4 Comments. Very cool! You look awesome! I bet you looked awesome before, too. Yay for things that make us feel good! Yeah, feeling good is so much more important than I used to think it was (before I discovered things I could wear that make me feel comfortable in my own body :D). I guess you already know about the current spate of lawsuits against J&J by Risperdal users who developed gynecomastia. Because J&J knew it was a possible side-effect but didn’t include it on the leaflet and because they illegally promoted off-label Risperdal use for children and teenagers and because J&J don’t want it going to court where company documents can be subpoenaed and the media will go into feeding frenzy the settlements so far have been quick and are rumoured to be quite substantial. Yes. Denis has been meaning to look into that and see if it would apply in my case — I was definitely underage when it was prescribed and it was definitely off-label, so there’s a fair chance it would. I’d be pretty happy if I could recoup the cost of surgical correction.